Winter has finally arrived here in Alberta, about two weeks late and it is not welcome. We've had such nice weather, although it has been windy, and now it is over. Each winter my sister and I have an arguement with my mom about what the true temperature is outside. She claims it's the temperature before you count the windchill. We say it's the windchill temperature. Her logic, you can get out of the wind. Our logic, it's Alberta, there is no getting out of the wind. We went to the ponies yesterday and immediatly regretted it the second we got out of the car. All the horses were still in the barn, that's the first time they've stayed inside all day because of bad weather since we've been here. We've had colder out, but it was because of the wind. In the morning the wind was extremely bad and the drop in temperature was so dramatic. We went out for Artemis first and as soon as we got out in the pasture, all the pasture horses came running. Artemis didn't even stop for us, she went straight to the gate and waited there. We checked their water and there was a thick later of ice and no water underneath. Don't you love winter? We did ride, but not for very wrong and only at a walk. Socks and Jimmy were both hyper and we figured a bit of excercise would be good for them, as long as they didn't sweat up. Artemis was feeling good too, she kept running around, bucking. When the stable owners got there we let them know about the pasture horse's waterer. He went out to attempt to unfreeze the pipes and we all felt bad for him. And then my jacket broke, it was lovely timing. -30 with the wind chill and my only winter jacket decideds that's the day my zipper needs to break off. It made for a very cold time putting the ponies back out. If it's any colder than yesterday, the ponies won't be coming in the barn. It doesn't seem that nice to bring them out of the freezing cold, bring them in the heat and then throw them back outside. As there is lots of snow and ice out, the horses' hooves keep getting packed full of ice. Honestly, it's not something I think very much about, it happens all the time. The horses at my dad's always have ice packed in their feet. We clean them out but after being out in the field for five minutes, it's packed back in there. 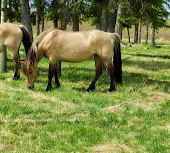 It doesn't bother them, they run around, play and graze just fine. It's just something that happens in winter that we need to deal with. However, several boarders at the stable were freaking out about it yesterday. They didn't want to bring the horses inside so they didn't slip on the cement so they went outside to try to take the balls of ice off. It didn't work. I usually let them thaw for a while and brush Socks until they're soft enough for me to use the hoof pick on. It was just, interesting, to see how upset other people were about something I've always considered to be normal and unavoidable. I don't leave the balls of ice on their feet, even at my dad's I usually bring a hoof pick and hack away on them but it's nothing to worry about. It happens every winter and it's just something we deal with. I honestly do find it very interesting to see what I get upset over with the horses, and what the boarders get upset over. A lot of the times it's not the same things. Oh my gosh, it has been so darn cold the past couple days. We got a big dump of snow Saturday evening here in Edmonton. This morning I thought my face was going to freeze off this morning while I waited for the bus at 7 am. It is currently -27, but feels like -38 with the windchill and we have a wind chill warning and everything. It was time to pull out the big boots and the furry hat! And I thought our winter was horrible! We don't even get snow and I feel like I might freeze, just imagine what I would be like in Alberta haha.